Rhapsody Tsavorite Garnet (1.00 Ct) 950 Platinum Ring 1.000 Ct.
Mozambique Garnet (Rnd), White Topaz Ring in Rhodium Overlay Sterling Silver 2.400 Ct.
GP Rhodolite Garnet (Hrt 4 mm), Natural White Cambodian Zircon and Kanchanaburi Blue Sapphire Ring in 14K Gold Overlay Sterling Silver 0.520 Ct.
Long considered to be a protective stone that wards off negativity, Garnets come in a range of stunning colours and their natural sparkle make them prized in the jewellery world - beads of Garnet have been appearing in jewellery for the last 500 years! The Garnet occurs in a kaleidoscope of natural colours including red, orange, yellow, green, purple, brown, black, pink and colourless, making Garnet jewellery a great choice for those who love versatility. 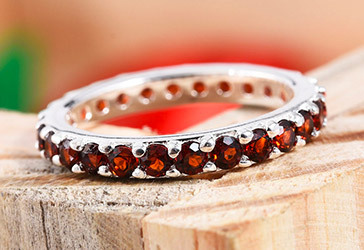 The word Garnet is thought to originate from the English word ‘gernet’ meaning ‘dark red’ and the Latin word ‘granum’ meaning ‘grain’ because they were likened to deep red pomegranate seeds. Incidentally, in Greek mythology this fruit is also regarded as a gift of love, and is said to symbolise eternity. Garnets are durable, measuring 7 - 7.5 on the Mohs scale, meaning they’re ideal for cutting and polishing for jewellery setting. This also makes them fairly resistant to daily wear and tear. All Garnets feature the same cubic crystal structure; a wide range of differing chemical compositions and physical structures then provides us with the many wonderful varieties and natural colours. Garnet is a gem steeped in history and can be dated as far back as 3500BC, first discovered in a necklace uncovered in Egypt on the neck of a mummified body. Further emphasising the luxurious colour of Garnet’s dark and deep red hue, this gem also symbolises passion and romance, making it a gem to gift to the person you love, so try Garnet earrings or a Garnet ring from our Garnet Collection. This jewel supposedly has the ability to illuminate even the darkest of rooms; it is written that Noah used the gem to light the inside of the ark. Another story tells of an old widow who, upon finding an injured crow in her garden, spent months nursing it back to good health. The widow became very attached to the bird and when the bird was fully recovered, she wept as she reluctantly released it. After several weeks had passed, while in her bed one night, the bird flew into her room and placed a large red Garnet at the side of her bed: the gem was said to have filled her room with light. Today the gem continues to be a symbol of love, passion, eternity and warmth. At TJC we have a vast range of Garnet jewellery waiting to be discovered… unearth beautiful garnet bracelets and bangles, stunning garnet Pendants, eye catching garnet necklace and many more garnet jewellery pieces.